From Sunrise to Sunset, you'll enjoy this delightful home that is designed to soothe the restless spirit. SUNSETS is a 4 bedroom, 2 bath home located on a high ridge in Duck and offers panoramic views of the most beautiful sunsets around - Thus, it’s very appropriate name! 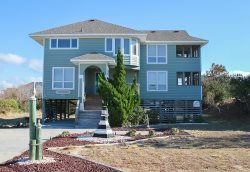 Relax on the decks and gaze out over the beautiful Currituck Sound. Watch windsurfers and kite boarders, or sit and watch your own family members as they give a new sport a try! Situated near the Duck Bike Path, it's only a short bike ride, jog or drive into the quaint village of Duck for shopping or visiting art galleries or having a wonderful meal at one of Duck's famous restaurants. SUNSETS is located in Colony By The Sea and offers you the advantages of a community OCEANFRONT SWIMMING POOL and TENNIS COURTS and a CHILDREN'S PLAYGROUND. You can even drive down to the beach and park for added convenience. After a day spent at the beach, unwind and relax on the spacious decks, under the stars, and get ready for another (ho hum) beautiful day!